I rise and I shine – Where Is My Teaspoon? As it is National Breakfast Week in the UK, I thought it would be fun to share one of my favourite recipes. 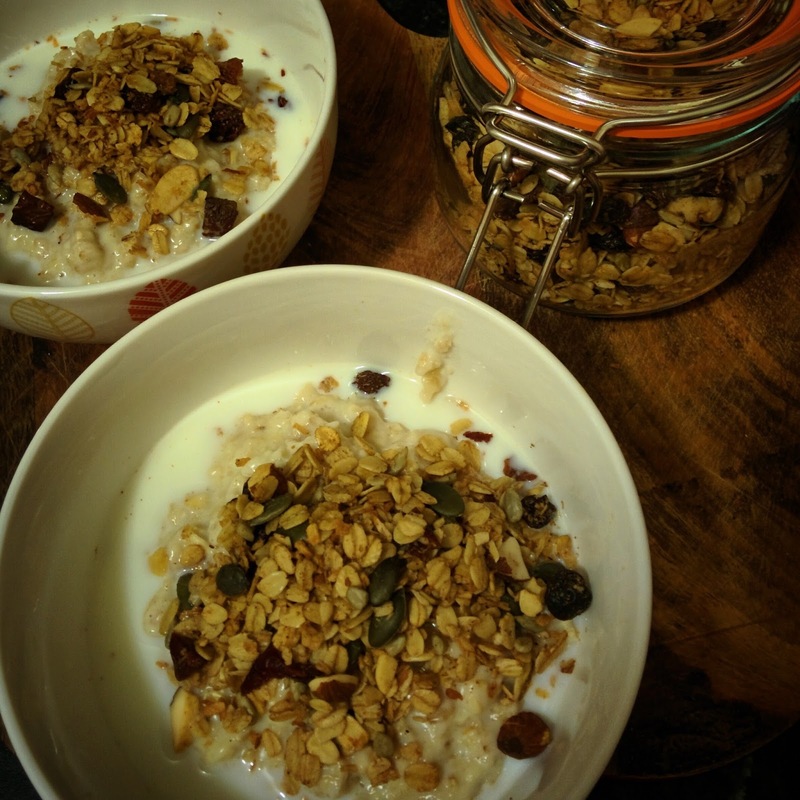 Home-made Granola is just way better than shop bought for so many reasons – cheaper, less sugar, more adaptable – and is so simple to make. I sprinkle mine over my porridge for a nutritious, warming breakfast. This recipe is a bit cheeky as I actually never measure anything out when doing it! This is so simple! I tend to start with 500g of Jumbo oats and go from there. I add as much nuts and fruit as I want but always remember to keep it within the ratios of typical granola. There should be more oats than anything else! I add 2 teaspoons of nutmeg and cinnamon and one of ginger. Follow this with one teaspoon of vanilla extract and about 50g (roughly) of desiccated coconut. You can add whatever type of dried fruit you like..I tend to go with sour cherries, blueberries and cranberries. I always just add whatever nuts I’ve got in the house – don’t feel you need to buy anything particular for this! The oil and butter will need to be heated very gently together. You want to coat your dry ingredients in this – not drench them so bear this in mind when weighing out. I add one tablespoon of honey (or less if I’m trying to cut back) to my warmed oil and mix before adding it to my dry ingredients. Like I said, you are just gently coating the dry ingredients. Mine looks something like this before it’s baked. Spread out onto your baking tray(s) and bake for 20 minutes on a low oven – around 130 degrees. Some recipes don’t advise you to add the fruit into the oven as they can become chewy (my favourite!) or can catch and burn. To eliminate this risk, I cover mine with tin foil for the first 15 minutes or so and then allow it to brown for the last 5 minutes. 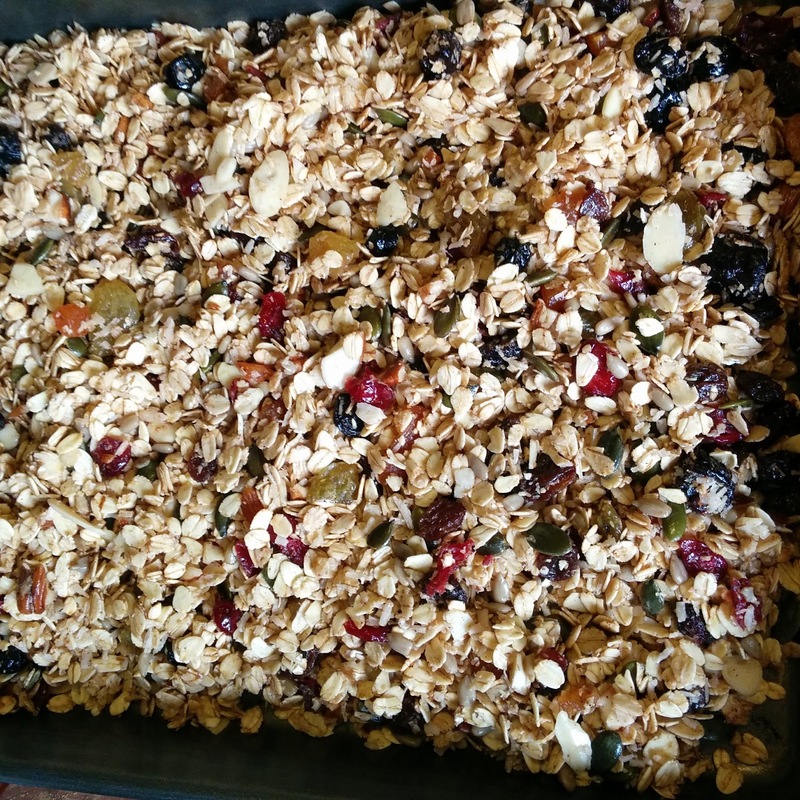 Make sure you constantly shake the granola round the tin to bake evenly. If you want to cook it longer or shorter, feel free! Also, if you don’t want to put the fruit in the oven, you don’t have to. I love a handful of this as a quick sweet hit after dinner, baked into breakfast muffins, sprinkled on fruit crumbles and of course, on top of my porridge! You could also have this on its own with milk but it would be quite heavy! Maybe something for a special occasion. 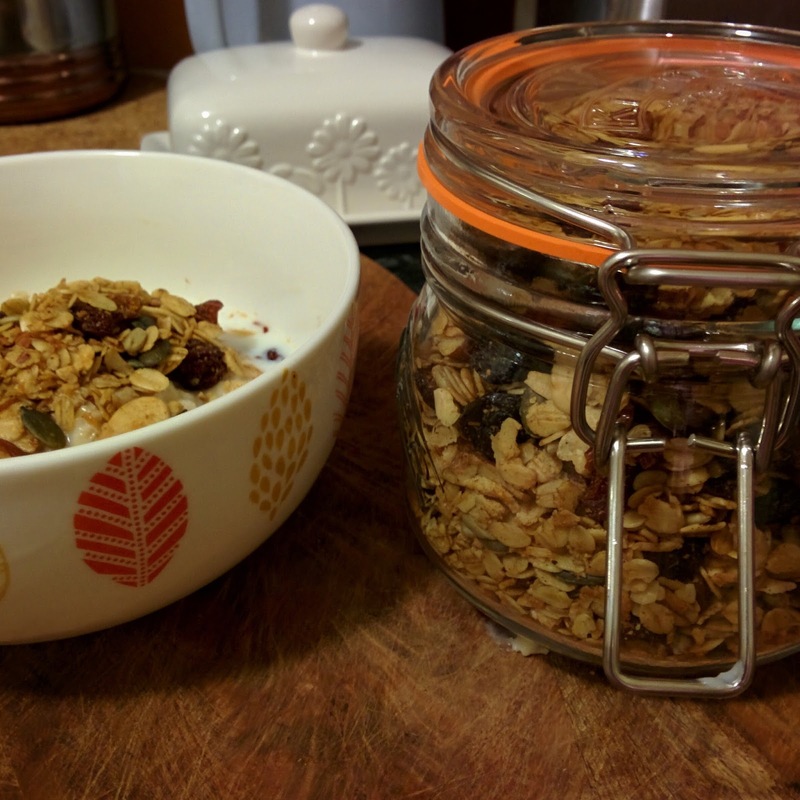 This granola will keep in a jar for about a month or so – if you don’t eat it all first! Previous Post Can you do the Quick Step?